Nothing makes fieldwork more amusing that shouting ‘Hang on, I’ll use myself for scale!’ when trying to photograph giant invasive plants. This summer I am working on the Hampshire and Isle of Wight Wildlife Trust (HIWWT) New Forest Non-Native Plants Project. 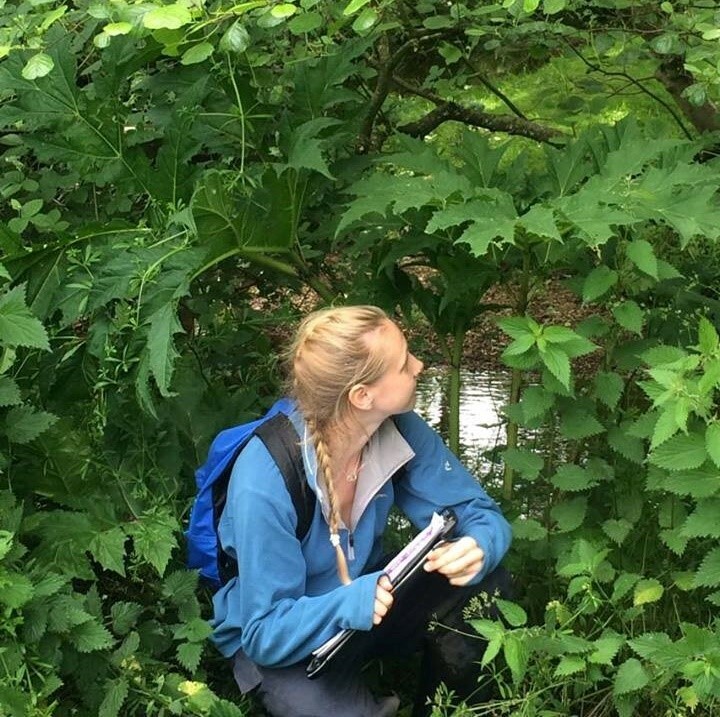 I and fellow Southampton student, Ben, have been provided with funding from the Excel Southampton Internship Programme to survey sites across the New Forest to monitor the effects of non-native plant removal and herbicide treatments. 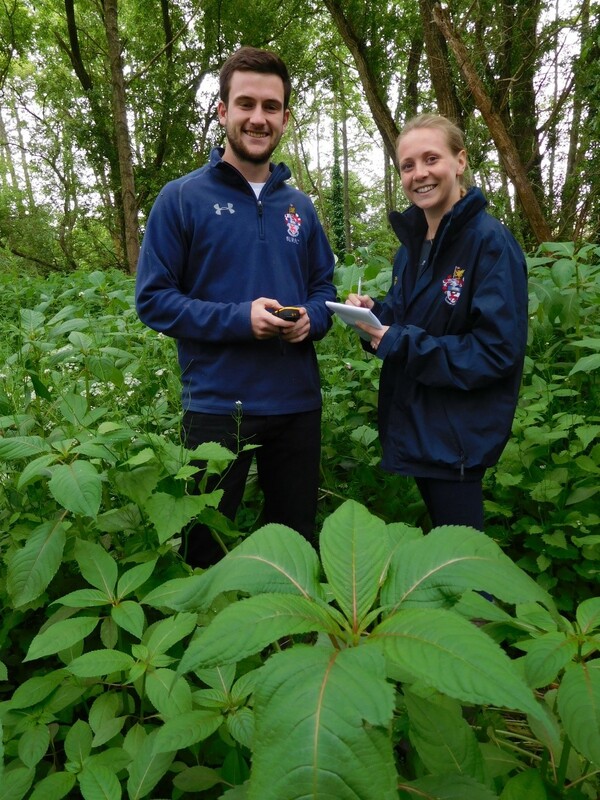 Ben and I surveying Himalayan balsam. Photo by Catherine Chatters. Invasive non-native (alien) species are those that have been introduced to an area outside their natural range, such aliens currently pose one of greatest threats to biodiversity following climate change and land-use change. As an island, the UK is susceptible to invasion with approximately 1000 non-native plant species established at a cost to the economy in the region of £2 billion per year. Focus in the New Forest is on riparian non-native plants, those that thrive alongside riverbanks and damp woodland where the river network provides passage for dispersal. In 2015 our predecessors carried out a baseline survey following which some of the sites were treated with herbicide or physically removed from all sites. Our aim and the project aim for the next five years is to monitor the return of plants and assess the effectiveness of treatments. 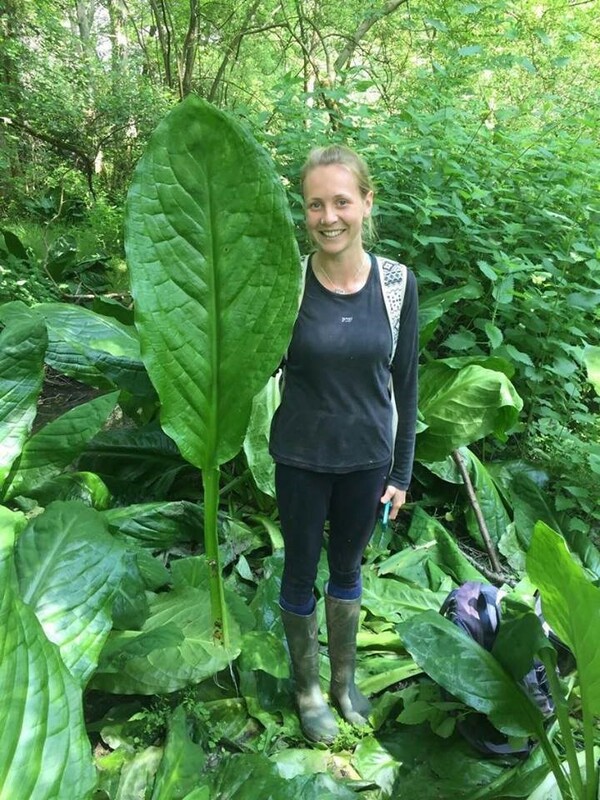 Surveying the first site which contained the American skunk-cabbage, native to North America, felt like travelling to the Jurassic era where giant plants provided sustenance to long lost dinosaurs. This alien species forms dense stands that negatively impact other plant species due to extensive shading. American skunk-cabbage leaf against the ‘Sophie Scale’. Photo by Ben O’Hickey. Ben and I estimated percentage ground cover of American skunk-cabbage, fought off numerous ticks and dangled precariously to get the perfect photo of a quadrat. As with American skunk-cabbage, Himalayan balsam spreads by seed dispersal but in a rather extravagant manner; its seeds are propelled through the air by exploding pods that can then germinate metres away from the parent plant or travel down streams to colonise further afield. It is the beautiful purple flowers of the Himalayan balsam that encouraged its introduction into the UK from the Himalayas. Either the ‘Sophie Scale’ is too small or the plants are too big! Photo by Ben O’Hickey. The sites we surveyed for Himalayan balsam were overrun despite annual removal. It was clear that in areas with lower abundance of balsam there was increased plant diversity (and a lot more stinging nettles!). 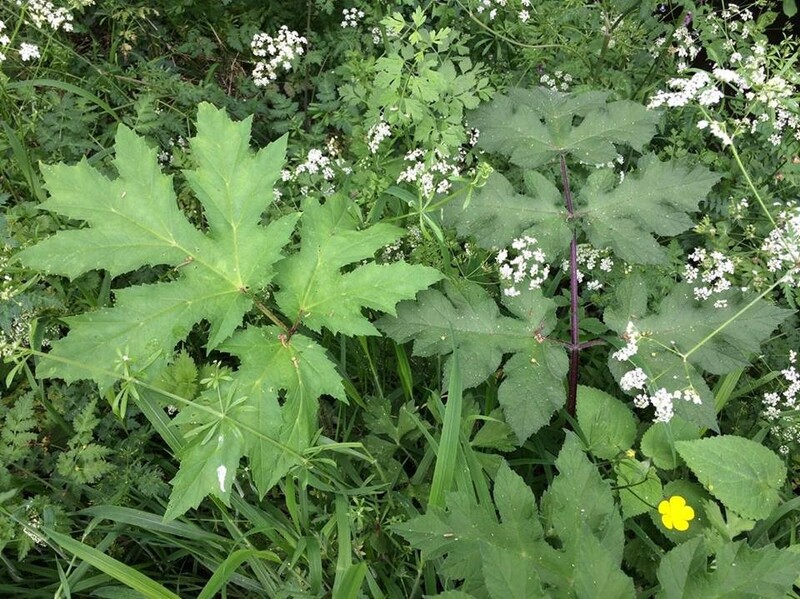 Giant hogweed (left) and native hogweed (right). Photo by Sophie May Watts. Not the biggest we found, but big enough. Photo by Ben O’Hickey. 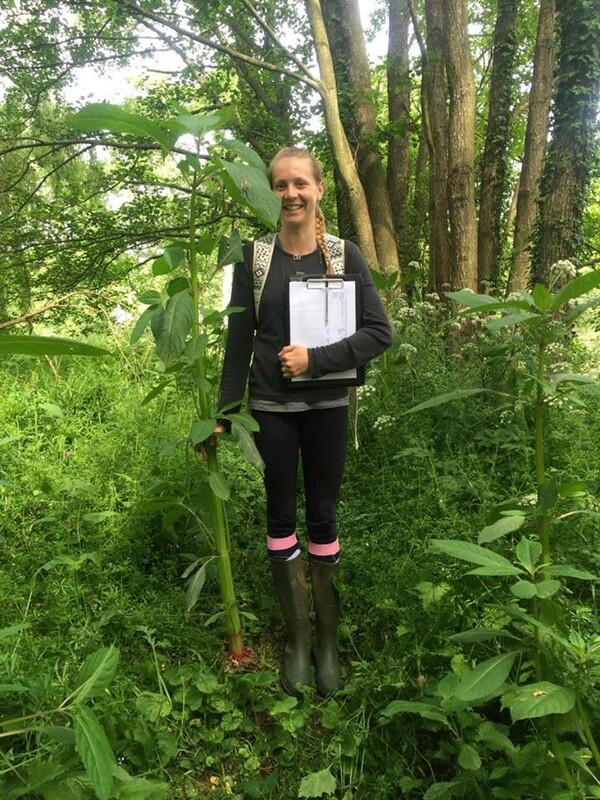 The only non-giant plant we surveyed was the Japanese knotweed, there was no requirement for the ‘Sophie Scale’ (although at one site they were still taller than me!) or quadrats for that matter as we were able to count the number of stems. Interestingly the seeds of this alien species are not viable in the UK and so it spreads through fragments of rhizome or stem, it is therefore seen in linear patterns. 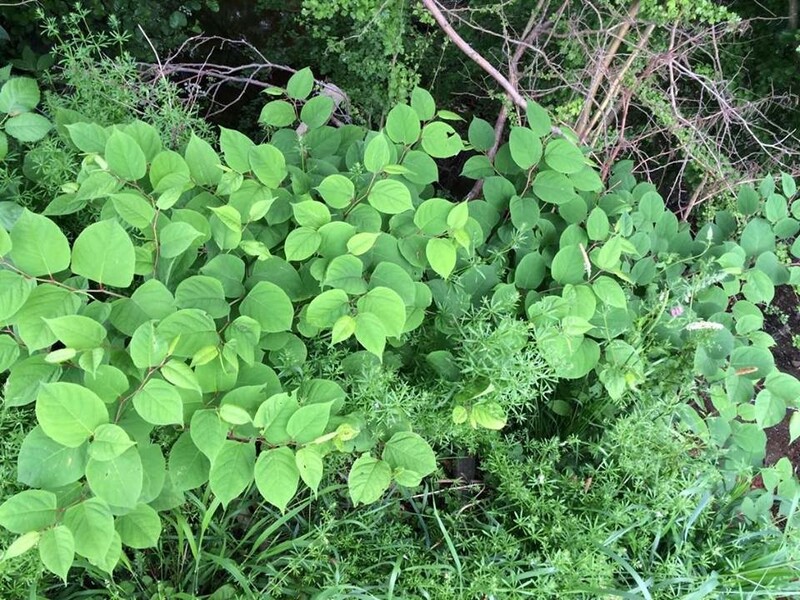 Linear pattern of Japanese knotweed. Photo by Sophie May Watts. During our surveys we have also been identifying, where possible, the species that surround each non-native plant. Neither of us are especially competent botanists therefore we have been utilising a couple of apps, after all there’s usually ‘an app for that’. Our favourites are Garden Answers and PlantSnapp. Garden Answers offers an identification A-Z guide as well as an attempt at identifying flowers and leaves by accessing the phone camera, whereas PlantSnapp is inspired by Snapchat as such that you send a photo to a panel of experts who identify it. The problem of invasive species is not confined to the New Forest, it is national, and in fact global. If you think you see any non-native plants in your garden or neighbourhood it may be worth reading through Schedule 9 of the Wildlife & Countryside Act 1981 to determine what your responsibility is as a landowner. Let’s crack down on these pesky aliens.